The first Canberra Fencing League season concluded last week with the victory of the Maison Honey Badgers. Of the nine teams entered, no team won or lost all of its matches resulting in a very close battle for places by all teams. Fencers looking forward for another season and those who missed out on the last one don't have long to wait, foil and sabre seasons will follow later in 2018. If you have any feedback on the last season, please let Kelvin Peh know. The Club's Annual General Meeting will be held at ANU Sport at 6.30pm on Tuesday 20 February 2018. An agenda will be published by Thursday 15th February. If you have any items you would like to add to this agenda, or if you're interested in joining the committee, please send us an email. The 2017 Katrina Kup was held on 2 April 2017, and showed that everyone is more invested in a competition when it is named after somebody. Since we don't have Issy on the committee to come up with new non-standard prize ideas, we dipped into our stock of ANU-branded rubber ducks for the medal ceremony. Jeremy is holding a takeaway cup holder because that's what we served the ducks on. Photo Credit: Rachael Spencer. Thanks to everyone who came out to compete, helped set up pistes, or just showed up to cheer on their friends and family. We'll see you all again soon for a foil competition! 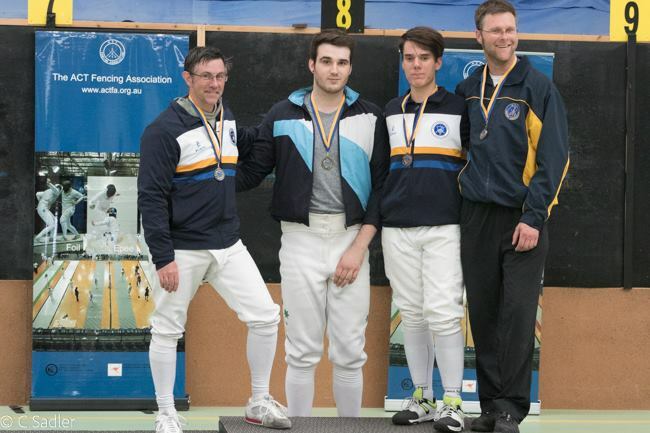 The ANU Fencing Club had a great time over the Canberra Day weekend down at the Tuggeranong Multi-sport Centre for ACTFA's State Open and Novice Championships. ANU Fencers competed in all weapons. There were also a number of ANU fencers who helped to referee, and to help run the canteen. Thanks to Chris Sadler for taking photos, to Carl Makin for running the DT and to the ACTFA committee for organising the competition weekend. Congratulations to our ANU Blues Award winners! The ANU Sport Blues awards are the highest accolade that a student athlete can receive at the ANU. The ACT's favourite Epeeist, Jeremy Shelley, received a Blue Award for his achievements and hard work. Sarah Jones got a Half Blue, which is like a Blue Award except... smaller? A paler shade of Blue? Anyway. Meanwhile, Amanda Ford and Michael Spencer received Peter McCullagh Achievement Awards. The club missed out on Small Club of the Year but now that we have more than 100 members we're looking forward to contesting Club of the Year against the defending champions, the Boat Club. The first club competition of the year was held the other week, and the flavour was Sabre. The winners were Amanda Ford and Jeremy Sadler, who received official ANUFC Blue Rubber Ducky trophies for their trouble. Full results are available here. Club rankings will have to wait until we devise a scheme for club rankings. Stay tuned for this Sunday, for our first Open Foil competition! Our future Uni Games athletes are just getting started. We had a great response to the beginners course for Semester 1, with a full Tuesday and a pretty busy overflow group on Sunday as well. They seem like they're getting the hang of it already, and the club is happy to have them. If you're new to fencing and you missed out but you're still interested in joining the club, join our Facebook group or send us an email and get in touch. There's still time for signups to the beginners' course! We've had a great response to the beginners' course for block one—in fact, we've had so many people apply that we're now oversubscribed. Not to worry, though. We're going to run an extra five-week course on Sundays, starting on the 28th February. The course starts at 11.30 each week—plenty of time to drag yourself out of bed and get down to ANU Sport. You can sign up on the beginners course page, and if you've got any questions drop us a line on the Facebook group or via email at anufencingclub @ gmail dot com. Over the weekend there was another big storm that caused some more damage to the hall that's currently under refurbishment. This has pushed out the day that the hall is suitable for use to 8 February. This shouldn't affect the scheduled training on Tuesday 9 Feb—hopefully it stays dry in the meantime. Do you remember that great weather we had late last week? All the storms, etc.? Well, it rained so hard that the roof at ANU Sport leaked while they were resurfacing the hall. So now they have to do it again. The original resurfacing work was due to be completed today, but this date has been pushed back because of the damage. We won't be back in until February 4 (Thursday). This won't affect the panel discussion that's happening instead of Witness The Fitness on 28 January. Because the ANU Sport halls are being resurfaced, and because Australia Day falls on a Tuesday, there will be no Tuesday training on the 19th or the 26th of January. Regular training will recommence from Thursday 28th.